Washington State blasted Arizona 69-28 late Saturday to set up the Apple Cup as worthy of igniting one’s hairstyle Friday in Pullman. While a few others in the dwindling field of elite college football teams wobbled Saturday, Washington State wowed. Piling up 407 yards and 55 points by halftime, the Cougars splattered Arizona 69-28 (box) Saturday night in Pullman — Gardner Minshew had a school-record seven touchdown passes — to set up an Apple Cup lollapalooza at 5:30 p.m. Friday at Martin (box)Stadium. Washington State (10-1, 7-1) vs. Washington (8-3, 6-2): Winner gets the North Division’s berth in the Pac-12 championship (standings) against Utah, the South Division champ. The loser gets the agony of a wasted opportunity, no matter how coaches frame it otherwise. The latest Associated Press poll released Sunday morning moved WSU up one spot to seventh. UW also moved up one to 16th. Pac-12 South winner Utah moved up three to 18th after its 30-7 win at Colorado. The weekly College Football Playoff rankings, which create the four-team field, will be released Tuesday. Normally the perpetual undercat, the Cougars this time have even loftier stakes than their first division title ever, as well as their first Rose Bowl appearance since 2003: A place in the CFP. 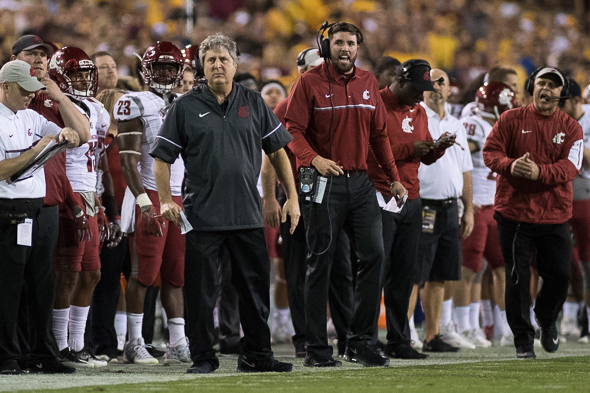 Given what can happen nationally in rivalry games and conference championships, WSU’s long shot for the fourth and final spot looked a teensy more plausible after Saturday. The AP’s top three teams, Alabama, Clemson and Notre Dame, moved to 10-0. The other four one-loss teams ahead of WSU also won: N0. 4 Michigan, No. 5 Georgia, No. 6 Oklahoma and No. 8 Ohi0 State. But the Buckeyes’ narrow 52-51 overtime win over mediocre Maryland dropped them to 10th. The Wolverines and Sooners had some hard times in triumph, and they all have formidable games ahead. So do the Cougs. But they can’t prep for the Huskies better than they did against the Wildcats (4-4, 5-6), who beat WSU 58-37 a year ago and had star QB Khalil Mack as close to 100 percent healthy as he’s been this season. Arizona was coming off wins over Oregon and Colorado with some momentum, but Minshew, the graduate transfer, was unstoppable. The nation’s leading passer had five TDs in the first half and finished with 473 yards on 43-of-55 passing. He had ample time to find his many targets, 11 of which caught throws before halftime. Tate was good, with 294 yards and four TDs on 18-of-30 passing, and Arizona gained 431 yards. But the Wildcats turned it over four times and WSU converted the turnovers into 28 points. The Cougars can’t fix their weak non-conference schedule, which will be held against them by the CFP committee, as will their loss to an unranked USC team that isn’t yet bowl eligible. Michigan’s loss was to No. 3 Notre Dame 24-17, Georgia lost to No. 8 LSU 36-16, and Oklahoma lost to No. 19 Texas 48-45. So all they can control is beating the Huskies for the first time in six seasons, then topping Utah in the title game, which they did at home Sept. 29, 28-24, then accept the Rose Bowl as a splendid consolation prize. If the Cougs win out and the committee doesn’t want the best story in college football this season at its final four, it’s their loss. The can keep Nick Saban, horns, tail, pitchfork and all, while the Grandaddy gets to flash the ‘stache. I think Alabama’s non-conference schedule is worse than the Cougs’ non-conference. Add in the fact they get an extra cupcake because they only play 8 conference games and I think an argument can be made if the Cougs win out and Michigan and Georgia lose again that the Cougs do belong in the top 4. Oklahoma has no defense leaving just LSU who is not going to play in their conference championship to jump over. in before a one-loss Pac-12 or Big 10 champion.” (Or is it the Big-8? You’re a geograph-ist. But I agree. Eight teams in the CFP makes for a fair field. Make the bowls agree. Hell, they’re all owned by ESPN anyway. I just want to see Alabama play a non-conference foe some place other than their home field or a neutral site. Looking at their future schedules I only have to wait until 2028 for that to happen. All the one-loss teams ahead of the Cougs could lose. I can’t wait for that debate. Apple Cup on Friday, why? Four teams blessed with berths in the playoffs, how about 8 teams? The mighty fine Dawg team coming to Pullman is must watch tvee. My beloved Cougs will be underdogs for this game. All I can say is GO COUGS. No way you guys are underdogs in this one ; you’re home and ranked 8th nationally . And I agree , the playoffs should be expanded if they truly want it to be the national college championship . Having said that , it’s been the Alabama/Clemson love-fest forever . Hard too see that changing anytime in the near future . When USC hires Saban, everything changes. Hollywood is a place for stars, and Saban fits the bill. The Rams now own the town (after LeBron), and Southern Cal needs a winner in a rebuilt Coliseum immediately. But, not even USC may have enough money to land Saban– including Helton’s buyout. Fight On likes homegrowns, including Lynn Swann……..and Pete Carroll? Well, John Robinson came back after 11 years. I think Pete has seen enough of the NCAA. New ownership of the Seahawks will dictate his fate. Petersen can’t wait to play the underdog card. Opens up the Boise State playbook. If you have to ask, you haven’t been following college FB the past 40 years: TV money. Should be fun watching Minshew being introduced to Mr. Gaines and Mr. Burr-Kirven Friday , as well as the Husky secondary . Dawgs defense needs to come up big to win this one in the Palouse . Gaskin’s gonna need a big game to help keep the ball out of the Cougs hands ; that Cougar offense is scary good . This is such a good game against 2 really good teams , and obviously the rivalry factor – they should televise it nationally . Go Dawgs ! WOOF ! Huskies can control the game if they can get Adams close to form. Which he was not on Saturday. And I don’t think he will be, in fact, until next season. Rust never sleeps. Never thought of it that way. I may have to steal that. They are televising in nationally. Why it is on Friday night. I’d guess. Turkey sammys, pie and Football — what better?! I had earlier predicted Cougs by 14+ in the Apple Cup. After watching the games yesterday, I may have had the spread too thin! I will take Leach’ play calling over Hamdan any day, and Minshew over Browning easily. The Huskies final 3 quarters were an embarrassment – 2 TD’s against a team that would struggle in the 4a championship! The Cougs will smell the Roses! After 28-6, the last 3Q were not much to judge on. Bigger factors: Home field and cold night. I guess the question will finally be answered. How deeply is Chris Peterson inside Leach’s head? My opinion is that Peterson has had Leach’s number for quite a while even back to his Boise State days. Leach has the better team this time though and clearly the better QB. I think it’s going to be a great game. I think anyone in Leach’s head won’t last five seconds. Stay out. In fact, run away. Sure, it’s obligatory for any red-blooded American college football player to pretend that he wants a piece of the CFP. But if the Cougs get that particular wish, they end up as cannon fodder for Alabama — on the short end of a 42 – 7 score or something in that range. Alabama is deep, tough, talented and without any apparent weaknesses. The celebrated Minshew, before winning the WSU quarterback lottery, was prepared to walk on for a 5th year at Alabama and sit happily on the bench as a third stringer. Just for the awesome experience of it. The consolation prize is playing in a Rose bowl game that WSU has an actual shot at winning. Posturing aside, that’s what the Cougs really should be hoping for. The Huskies’ problem is that Minshew hasn’t been in Pullman long enough to have learned the local traditions. He probably doesn’t even know what “Couging it” means. He has no experience of getting his rear-end kicked year after year in the Apple Cup. Will his upbeat confidence prove contagious and lift the team to greater glory? If so, it would be enough to make Eeyore smile and dance. Or maybe even Mike Leach. You don’t get to be a top player at a Power Five school be being scared easily. Minshew’s newness does indeed insulate him from recent tradition. Which should scare Huskies fans.